KAUAI, Hawaii — Wasps nearly claimed the life of a South Jordan man during a family vacation on the island of Kauai, Hawaii, on Tuesday. Jake Shoff survived thanks to the intervention of what his wife described as “angels,” two passing strangers who put their own lives at risk to keep his head above water. 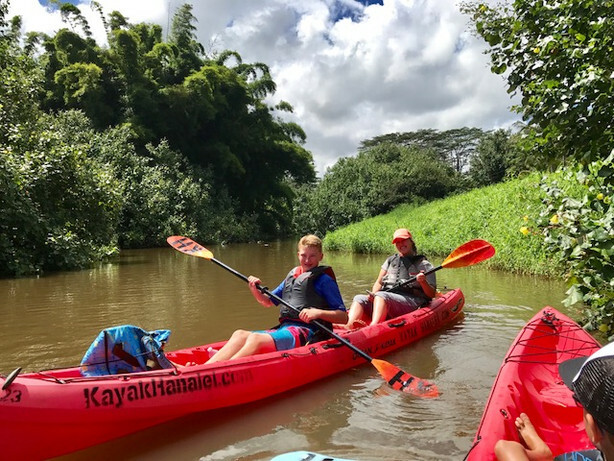 Shoff and his wife, Emily, had taken their sons Zach, 14, Brady, 10 and Grant, 3, out on a pair of kayaks on the Hanalei River. They had started their day with a prayer, asking for safety and were floating down a placid stretch near the town of Princeville when Jake’s boat veered into brush along the riverbank. It hit a wasps nest. Within moments, the insects were attacking the Utah family. Jake, a former college athlete who played basketball for BYU from 2001 to 2004, sought refuge by overturning his boat, dumping himself, Brady and Grant into the water. All three had already been peppered with stings. Emily Shoff, who is six months pregnant, fished Grant from the water as Jake pushed the capsized plastic craft toward the opposite bank. “Two women were heading towards us on their kayak, and I just waved at them and said, ‘Hey, stay away from those wasps,’” Emily Shoff said while recalling the situation Thursday. Jake Shoff, who is 6 feet 9 inches tall and weighs roughly 300 pounds, was not able to easily re-enter his kayak from the river. The two women paddled closer, offering to help. They braced his boat, providing a counterweight to keep it steady as he climbed aboard. Once out of the water, Jake mentioned to Emily that his iPhone 7 had survived being submerged. He handed the device to his wife and started working to get Brady back onto the boat. She grabbed the back of his life jacket, keeping his head from submerging. The two passing women had paddled up close to the Shoffs. One of them, Michelle Garcia Winner, had been trying to move into Jake’s kayak when it rolled a second time. She ended up in the water as well. She grabbed hold of two of the kayaks and draped Jake’s arm over her own. The second woman, Pam Crooke, jumped in behind Jake. She stuffed a spare life jacket under his armpit. Winner and Crooke, neither of whom was wearing a life jacket, pinched themselves in between two of the three kayaks. Zach, in the boat with Emily, had grabbed hold of nearby branches to keep their fleet from floating apart. Jake, meantime, had lost consciousness and began foaming at the mouth. To read the full, miraculous account on KSL, click here.